Blue Arab. I still puzzle over the common name given to this HolyLand butterfly. I was determined to see and shoot them. There was this aura of different, of exotic and almost inaccessible for me. I’m not especially fond of travel, and surely don’t like traveling alone. How’d I get there? Took the train south from Binyamina, past thousands and thousands of acres of lush agriculture, to Beir Sheva University station. Took a bus from the train station, past hundreds and hundreds of Bedouin homes, then along the west coast of the Dead Sea, to my destination, the SPNI field house at Ein Gedi. 93F and bone dry. This is the same Ein Gedi that features prominently in the history of Christians and Jews. It remains tiny, and undeveloped. It is something to behold, for there is where you get the scale and sense of what it was like, at least some sense of that time. There was an ancient synagogue there, and it was not much like today’s centrally air conditioned types. I was near constantly tickled with the stark reality of the place. Really, I was. So many walked there, fled to there, studied there, dreamed there. The connection to us is moving, very. This male Blue Arab butterfly denied my getting too close, though he did allow this camera click, and it nicely reveals much. Been to the Arava Valley, Dead Sea area? That’s the arid strip that has Israel on its west and Jordan on the east side. That’s where you’d have to go to see this Blue-Spotted Arab Butterfly. I went there. I took the Israel train to the Beer’sheva University station and caught a bus for a nearly 2 hour drive down a gently descending landscape, to Ein Gedi. Blue-Spotted Arabs were why I went there. They looked so different, so exotic. I stayed in the SPNI Ein Gedi guest quarters. Didn’t have a rental car, and glad of that, for the bus ride from the train station passed hundreds of homes whose Bedouin residents probably . . . Here we go again. Jeff? 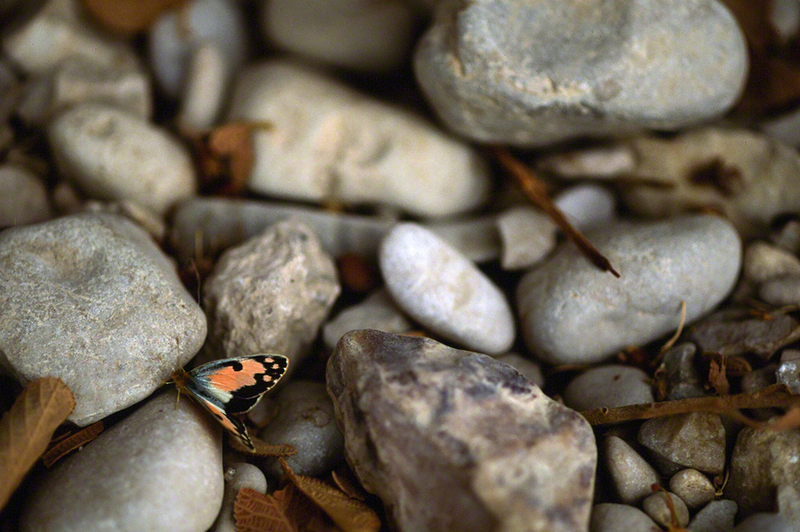 Why don’t you share images of this butterfly that are more easily seen? Well, Elvira, they prefer rock strewn habitat, and each and every time you attempt to cross over the rock to exercise your Macro- lens, they would 23 skidoo! They were mostly seen along the ‘walls’ lining Wadis (bone dry riverbeds) and that was a crapshoot, for the wadis sported signs Warning!!! all to not enter the wadi, for should a snap! storm hit, those wadis suffer surges of water of incredible ferocity. I’m here with you, so good, there were no such that day. In the last year I’ve walked down streets in Pittsburgh, PA; Savannah, GA; Irvine, CA; Brooklyn, NY; Jerusalem, Israel and New York, NY. People watching is quite interesting. I always see an infinite number of faces, shapes, dresses, types of walk, etc. You never know who you will see next. Will they exchange glances? Will they greet you with a “Hello!” Will they reciprocate your joy of living, joy of experiencing live in its fullest, and for the near future, joy of your freedom from chaos, mayhem and evil? So it is when you move through a habitat to find and photograph butterflies. You already know most of them, and they don’t vary much from one to the next, until? Well this female caught my eye while I was photographing the site of an 800 year old, excavated synagogue in Ein Gedi, Israel. It was a tiny butterfly; her proboscis was actively collecting nectar from this bush, and she tolerated my careful approach. Azanus Ubaldus populations are found from the Dead Sea south to the tip of the Sinai Peninsula and then along the western coast of the Sinai (D. Benyamini, A Field Guide to the Butterflies of Israel). Moments later, she is gone! The feeling of satisfaction that follows an encounter with a butterfly I’ve not ever met before is . . . Well you know the feeling. We all experience it, however it is triggered in each of us. This is our fourth post of Colotis Phisadia, otherwise known as a Blue-Spotted Arab Butterfly. Hours of travel and three mornings of dedicated pursuit yielded a good result. Residing in Wadi David at Ein Gedi, this is one dedicated butterfly. The Blue-Spotted Arab Butterfly has spent much of this morning making his rounds, never flying too far from his starting point. In full rich color, he patiently waits for the opportunity to display his primacy and his genetic finery to potential mates. The Wadi David at Ein Gedi was bone-dry. It’s inevitable that at some point we pause and ask, “How do these butterflies satisfy their need for water?” The sky drizzled rain drops the next morning, for just about five minutes. For those of you who haven’t yet seen the three other posts of Blue-Spotted Arab’s, we photograph with a Macro Lens, using a hand-held camera. 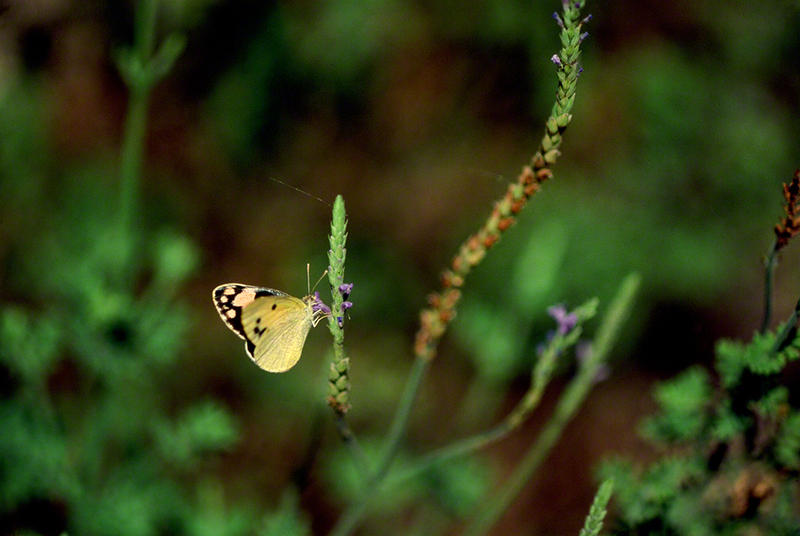 This is one tough butterfly to approach, especially in the Wadi. Our images were the result of much negotiation. The butterfly allowed us to approach within four feet, and we agree not to come one inch closer. A successful negotiation in the Middle East. Good. The Colotis Phisadia males have been already been posted. 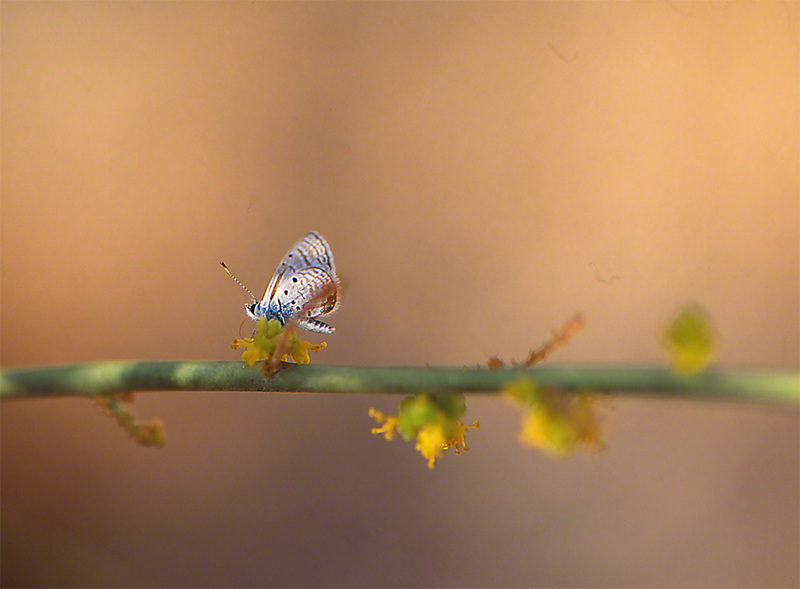 Happily, we can introduce this female Blue-Spotted Arab Butterfly. You might be wondering about the wildflower she is sitting on. It’s not known. In my travel, males were much more numerous and available for photographing than females. The males spent many more hours flying and resting. She has different goals. Her primary one is eating nectar. We discussed how skittish this species is. It’s well and good that this one allowed a moderate approach by a photographer. Females show a more pronounced yellow. Of the photographs we took, we prefer this image, with its display of both ventral and dorsal wing. I miss those December mornings at Ein Gedi. Like any exotic habitat that you are lucky enough to visit, you never know what you’ll see one minute to the next. How do you know when you are so blessed? You know because you find yourself frequently checking what time it is, reluctantly acknowledging that morning is quickly slipping away. In the afternoon, there’s way too much sun to capture images of winged beauties.